Some people may think teeth grinding is a hopeless problem, but there’s actually a product specifically designed for that bad sleeping habit. Bruxism is uncontrollable while you’re sleeping, yes, but that’s only the case if you don’t cover your teeth with something tough. 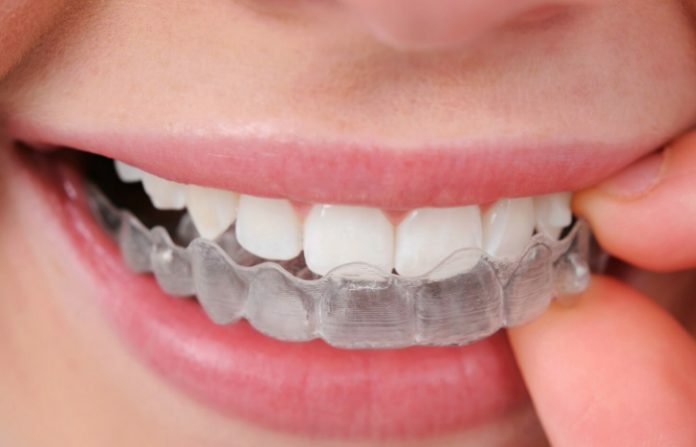 To protect your pearly whites, consider buying the best night guard for teeth grinding. Recommended by dentists and approved by the FDA, J&S Dental Lab Night Guard can be customized to fit your teeth. You have the freedom to decide about its level of hardness and thickness. Available options include soft, semi-hard, and hard teeth guards. When it comes to thickness, the selections range from 0.06 to 0.16 inch. Since durability is also crucial, this night guard can last up to five years. However, that depends on how severe your habit is. Now, let’s focus on the material. Don’t worry about the synthetic look of this product. It doesn’t contain latex and bisphenol-A (BPA). 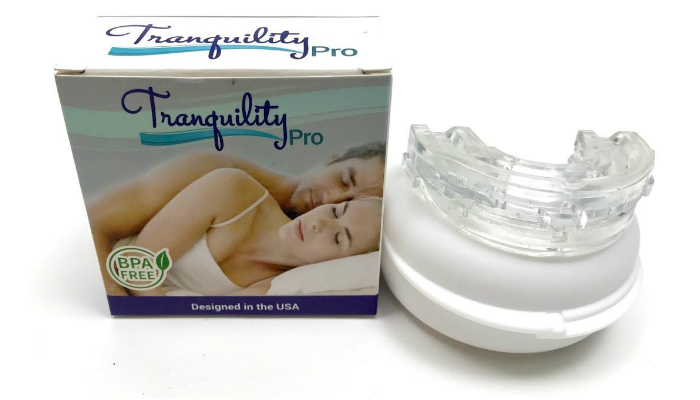 Neither too tight nor too loose, Tranquility Pro Bruxism Night Guard will fit your mouth perfectly. All you have to do is submerge it in hot water for a minute, cool it down a bit, and gently bite it until the form matches your teeth. This mouthguard can also solve other sleeping problems. In particular, it can improve your breathing, which may reduce snoring. Feel free to consult a specialist just to make sure. Bruxism raises serious issues that can affect your life more than you expect. It can lead to facial pain (especially at the jaw), headache, tooth sensitivity, and damage of dental work such as crowns and veneers. Armor Guard Pro-Form Nite Guard aims to prevent or solve all of those problems. To remain sanitary for your sake, this product comes in a protective case. 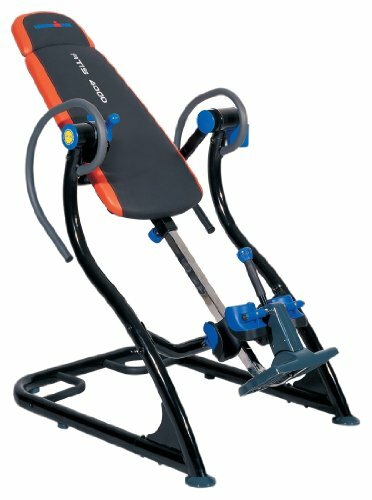 It is also made of high-quality material to boost durability. It is not made of thin plastic, hard acrylic, and latex. 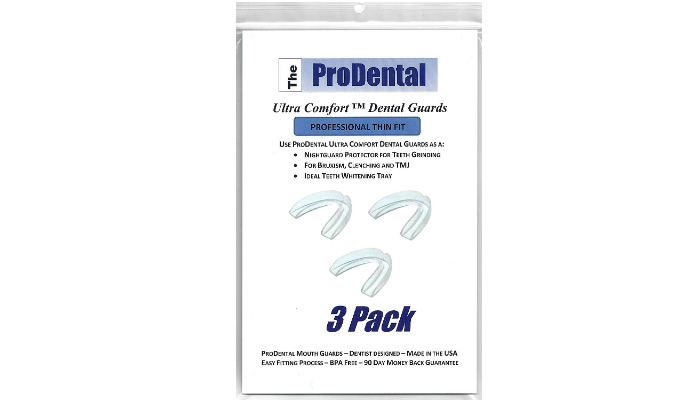 If you have a small mouth, ProDental Ultra Comfort Dental Guard is an excellent choice. It has thinner or trimmer options available. Regarding the material, this night guard is made of odor-free polyvinyl without any aftertaste. It can last for at least one year no matter how frequent you grind your teeth. 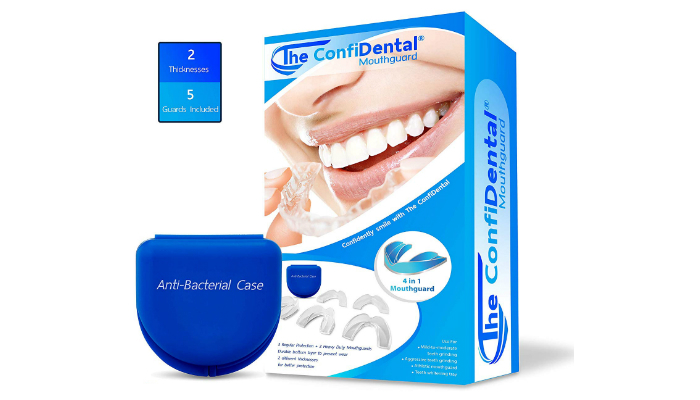 Aside from preventing bruxism, The ConfiDental Moldable Mouth Guard can also improve the color of your pearly whites. To be more specific, it comes with a teeth whitening tray. Don’t worry; it’s so safe that it can be used by anybody including kids. Meanwhile, the material used for this product is super-easy to clean. That’s mainly because of its antibacterial case, which promotes minimal cleaning. The simplest explanation for bruxism is the presence of orthodontic problems. If you have an abnormal bite or flawed teeth due to gaps or crooked sections, you unconsciously clench your jaw in an attempt to align everything. According to Nierman Practice Management, stress can activate the sympathetic nervous system even when the person is asleep. That part of the nervous system is actually responsible for the fight-or-flight response, an involuntary reaction. So, it’s a no-brainer that teeth grinding is usually done unconsciously. How exactly do stress and anxiety come to play while you’re sleeping? For example, you’re sleeping in an uncomfortable position. If you’re starting to feel the strain in your muscles, the sympathetic nervous system makes your body react to that, which may lead to teeth grinding. Good thing that we discussed the link between stress and bruxism first. Obstructive sleep apnea is obviously stressful for your body. What happens if you have sleep apnea? Based on the explanation from the National Sleep Foundation, the condition is specifically caused by relaxed throat muscles. That results in a blocked airway, ultimately leading to breathing issues. Since breathing is clearly crucial for survival, the sympathetic nervous system is activated. Sadly, it could happen at the expense of your dental health due to bruxism. Not taking chronic bruxism seriously might force you to undergo multiple procedures for the sake of your teeth. Grinding can ruin permanent teeth, which calls for drastic solutions like dentures, implants, root canals, crowns, and bridges. Prevent or stop temporomandibular disorders (TMD). TMD can trigger tremendous pain around your face, especially in your jaw. Worse, one can experience it for several years. In some cases, TMD can spread pain all over the neck, shoulders, and ears every time the person opens his mouth. It can even lock jaws. Additionally, TMD has a tendency to affect your health due to lack of appetite. It can cause chewing or biting problems. Don’t consume too much caffeine. Avoid drinking coffee and sodas in large amounts. Try your best to quit alcoholic drinks. Stop clenching your jaw even while you’re awake by avoiding chewing gums. Relax your jaw muscles as frequent as you can. Do this by gently biting the tip of your tongue. Before sleeping, press a warm washcloth on your cheeks to relax your jaw. 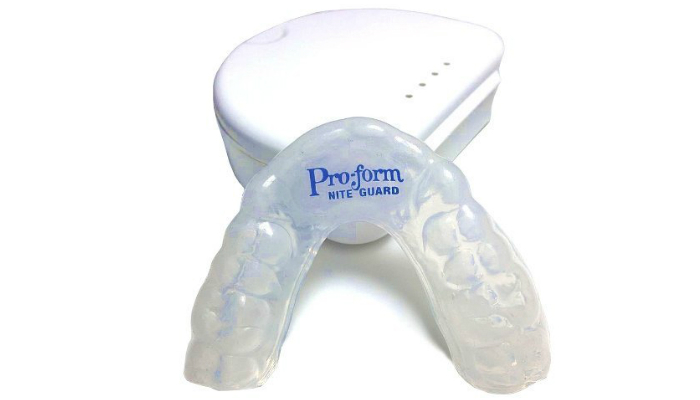 The best night guard for teeth grinding is versatile, durable, and safe to use. 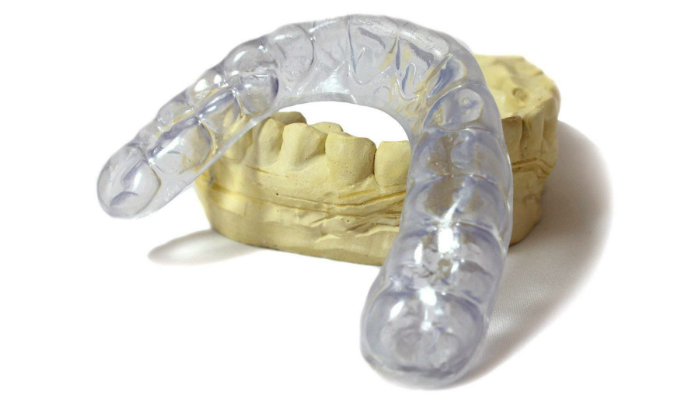 J&S Dental Lab Night Guard can fit your teeth perfectly because of its customizable form. 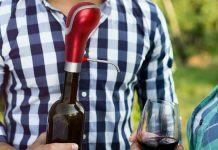 Its nontoxic material is tough yet flexible. Meanwhile, if you have braces, learn how to use an interdental brush or an electric toothbrush properly.